Richie Hawtin has recently marketed himself as being at the forefront of techno innovation, so his revival last year of Plastikman, his somewhat less suave 1990s pseudonym, came as quite a surprising career-move. Hopes for the bespectacled no-nonsense days of yore were soon dashed, however, with promo pics of the 41-year-old sporting a sleek hipster haircut and eyeliner. The project had been injected with a healthy dose of nowness, and a very expensive looking live show. This is Plastikman 1.5, with tickets costing near the business-minded 30 quid mark. The Brixton Academy show is said to be sold out, but the place is far from rammed during Hawtin’s label mates’ sets. Their identikit Playmobil hair-cuts, curiously similar to Hawtin’s, are perhaps the most interesting thing about their slinky, minimal performances. The sound is too quiet, and sadly, this does not improve much for Hawtin’s set. The unveiling of the monolithic visual column, a druggy Panopticon with his shadowy self imprisoned inside, is certainly arresting, but the sounds emanating from it never match the spectacle for drama or tension. Things feel staid and subdued; loops upon loops that never stray too far or take any chances. Recognizable snippets poke their head above the parapet, and are soon annihilated. Hawtin is undoubtedly working hard, bent over and wrestling his analogue and digital machines into submission, but it all seems to be locked into one gear. The audience reflect this, with a dazed, restrained atmosphere pervading. The much-touted interactive element of the show seems to be lost on them; many are merely filming the visuals, holding their phones up like passive zombies. This is not dance music’s celebrated euphoria, and people aren’t dancing with each other. Spastik, Plastikman’s signature track, emerges at the end, as does its creator to the front of the stage. The audience finally wakes from its slumber. 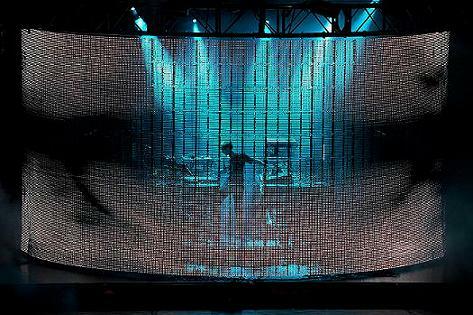 Richie Hawtin is not alone in his efforts to ramp up the spectacular aspect of live electronica performance; Amon Tobin is also making headway in this area with his own equally ambitious one-man multimedia show. Arguably, his is the greater success. The Plastikman experience, for all its boasts of technological advancement and interaction, feels distinctly 2D. Perhaps in a club environment, with a smaller audience positioned around the visual carousel, it might feel more involving. Hopefully Plastikman 2, currently in the works, will move in this direction.